The news of NHTSA regulators looking into a potential problem with the Tesla Model S’ suspension blew up yesterday after literally hundreds of media outlets, from Reuters to the NY Times, picked up the story. There are a lot of misleading headlines and reports out there right now so let’s focus on the facts we know so far. The actual potential problem with Tesla’s suspension is only part of what prompt NHTSA to probe the situation. 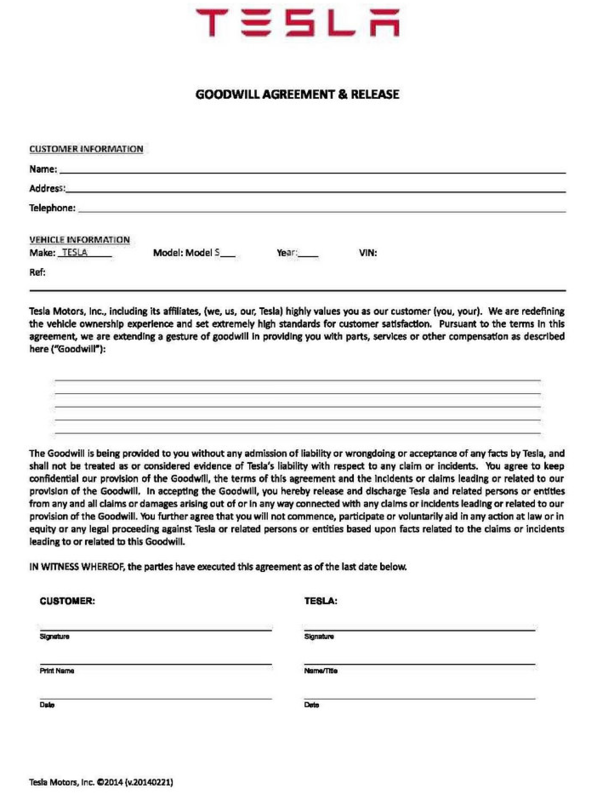 Media are widely reporting that Tesla attempted to cover up the alleged problems by making owners sign a non-disclosure agreement. Update: Tesla reportedly agreed to update the Goodwill agreement to clarify that anyone signing it is in no way prohibited from reporting the repair to regulators. First of, there’s currently no investigation or recall over this issue with Tesla. NHTSA is currently reviewing the case in order to decide if it needs to open a formal investigation. We will update if we get more information from the agency, but Tesla is already out with a statement claiming that there’s no defect on the Model S’ suspension and that the ‘NDA’ was not aimed at dissuading anyone to contact regulators, but they will work with NHTSA to correct it if there’s a need. I have owned my Model S since May of 2013 and truly love the car. With that said, I must tell everyone about a recent problem I experienced this past Sunday while driving on a back road at a very low rate of speed, about 5 MPH. The road was rough so my air ride was at it max lift. As I was proceeding down a steep hill I heard a snap and felt my steering wheel pull to the left. I stopped the car for further inspection only to discover that my left front hub assembly separated from the upper control arm. Needless to say the car was inoperable due to a loss of steering. Thank goodness I was not traveling at a high rate of speed. This could of been a tragic accident causing injury or even death. I contacted Tesla and they towed the car to a service center. They just informed that this is not covered under warranty, stating that the cause was due to normal wear and tear. I have owned many cars in my life and have never experienced such a failure. My car has been driven 73000 miles. Has anyone experienced this failure on their car? The owner, Pete Cordaro, added that Tesla still offered to pay 50% of the $3,100 repair cost under goodwill since it determined that it was normal wear and tear based on the use. Obviously, the suspension is not supposed to give up at 73,000 miles, but in this case, Tesla determined it was normal because of the owner’s use – he lives on a long dirt road which put a strain on the vehicle after more than 70,000 miles. It’s a fairly boilerplate document for a repair outside of warranty, but the owner saw it has a potential attempt at covering a possible pattern of defects. It’s a way to make sure that Tesla is not admitting any wrongdoing by performing a repair free of charge or discounted even though they claim it is because of the customer’s use. Any results on the testing of my worn ball joints? Now so far this is all routine stuff, there’s one problem with a vehicle and regulators want to make sure there’s no pattern of defects that could prompt a recall, but what prompt all the media attention was how a blog picked up the information and spun the story into not only a pattern of defects but also an attempt at a cover-up. Edward Niedermeyer of the Daily Kanban published ‘Tesla Suspension Breakage: It’s Not The Crime, It’s The Coverup’ earlier this week. Before writing on the Daily Kanban, Niedermeyer was associated with ‘thetruthaboutcars.com’ and he ran the ‘Tesla Death Watch’. For years, he predicted Tesla’s death and posted every possible story that he could spin to paint the company in a bad light. He gave up on the death watch back in 2010, but he is still often commenting on Tesla on his other website. In his latest blog post, Niedermeyer described the situation above as a defect and not normal use. He said that there was a pattern of suspension problems based on unsubstantiated forum posts and he claimed the Goodwill Agreement was an attempt at a cover-up. A bunch of media felt safe to pick the story up from there because of NHTSA’s comment, but honestly, it doesn’t look like there’s much more to it than someone being rough on his car’s suspension and Tesla meeting him halfway on the repair while making sure it doesn’t come back to haunt them.